Click, Click! Snap! Snap! You can secretly create this sound effect thanks to AmazeKids partner RosenGadgets and Magic Wagon. 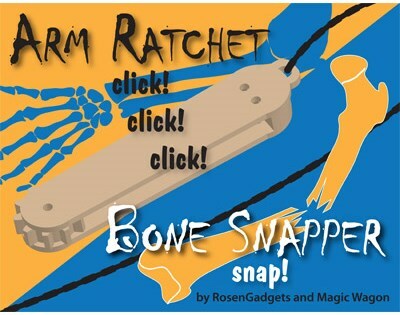 This Arm Ratchet / Bone Snapper gimmick even has a vanishing "pull device" so you can show your hands empty after making the sound! Check out the video above. Based on the old watch winder device, by simply turning a small wheel with the subtle movement of your thumb, you can create the sound of breaking your finger, or a spectator's neck! Here's just a few of the many uses for this clever gadget! Create the sound of a key winding up a the classic Handkerchief Mouse popularized by Quentin Reynolds. Use as a comedy Arm Ratcheting Device when you "pump" a kid's arm for the Comedy Funnel. Best of all, the attached pull device allows you to end up completely clean -- with absolutely nothing in your hands. This is a great, affordable utility device for every magician! Get the Arm Ratchet / Bone Snapper and get cracking today!